Clinical development of prostate cancer vaccines is moving forward. 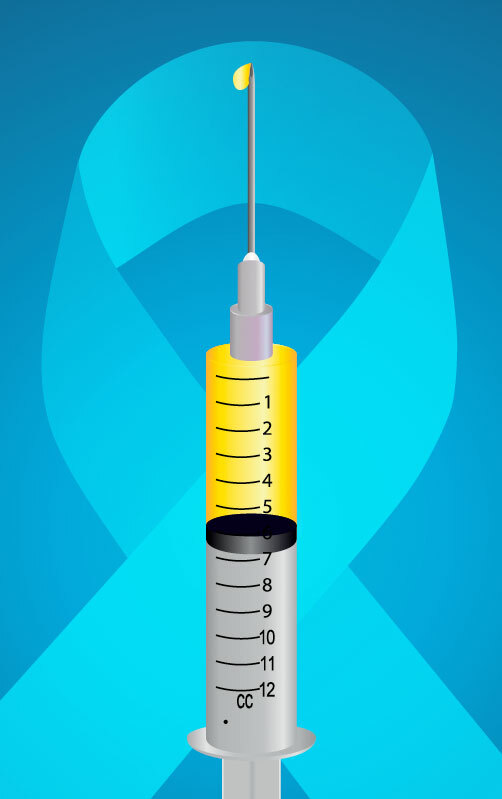 The field of prostate cancer vaccines remains an area of active exploration, with clinical trials into the already approved immunotherapy Provenge (sipuleucel-T) continuing and a phase 3 study into PROSTVAC reaching full enrollment. Research into emerging compounds also is under way, including an early study that pairs a vaccine candidate with the immunotherapy Keytruda (pembrolizumab). Provenge, an autologous dendritic cell vaccine, remains the only therapeutic prostate cancer vaccine with regulatory approval. Among vaccines under study in prostate cancer, PROSTVAC is a front-runner in the field. The vaccine has yielded promising trial data and falls into the injectable class, involving an initial shot of recombinant poxvirus and several booster shots of recombinant fowlpox. Both Provenge and PROSTVAC share a common drawback in that clear biomarkers for which patients would benefit most from the therapies have not yet been validated, although this is an area of active investigation, according to Mark Stein, of Rutgers Cancer Institute of New Jersey. Stein is a medical oncologist at the institute and assistant professor of medicine at Rutgers Robert Wood Johnson Medical School. He was involved in a recently concluded phase 2 PROSTVAC trial. Stein believes that further research on Provenge bears watching and that it could well develop that combining the drug with other therapies will demonstrate additional value. Ongoing clinical trials include phase 2 studies in combination with Yervoy (ipilimumab) in chemotherapy-naïve metastatic castration-resistant prostate cancer (mCRPC) and with Xtandi (enzalutamide) in men with mCRPC. Yervoy is an immunotherapy known as a checkpoint inhibitor because it helps lift away natural checks and balances that keep the immune system from launching a full attack on cancer cells. It has been approved by the U.S. Food and Drug Administration for the treatment of melanoma. Xtandi is a hormonal therapy approved for the treatment of mCRPC. Regarding PROSTVAC, the pending results of a large, multicenter phase 3 trial will shed light on whether the vaccine makes any “definitive” contribution to overall survival (OS) in advanced prostate cancer, Stein says. Nearly 1,300 men have enrolled in the global PROSPECT study, which is designed to investigate whether PROSTVAC alone or in combination with granulocyte-macrophage colony-stimulating factor is effective in prolonging OS in men with few or no symptoms from mCRPC. In addition, a phase 2 study that would combine PROSTVAC with Yervoy is in the planning stages. Vaccines based on the Listeria bacterium also hold promise and constitute another prong in this field of advancement. Currently, the phase 1 / 2 KEYNOTE-046 trial is combining the experimental Listeria monocytogenes immunotherapy agent ADXS-PSA, which has been modified to target prostate-specific antigen, with the checkpoint inhibitor Keytruda (pembrolizumab). The trial aims to enroll 51 patients with previously treated mCRPC. Live attenuated Listeria-based vaccines can generate immune system responses that destroy tumor cells, and they have already been studied in pancreatic cancer and mesothelioma. These drugs can help to stimulate the immune responses necessary to facilitate the use of checkpoint inhibitors.